Brisbane Patios is a specialist patio builder, installer and renovator. A patio is an architecturally appealing outdoor addition to any home that adds both value and living space, it’s an ideal way to transform your outdoor space, creating a seamless transition from the inside to the outside. It’s an area completely protected from all the elements of the weather, providing a protected, useable and functional area ideal for barbeques, entertaining, sheltered play area or somewhere to just get away and relax. There is a large choice of styles and designs that will fit perfectly within the existing design features of your home and the possibilities to maximize your indoor-outdoor living are limitless. We believe every design should be as practical as it is desirable. 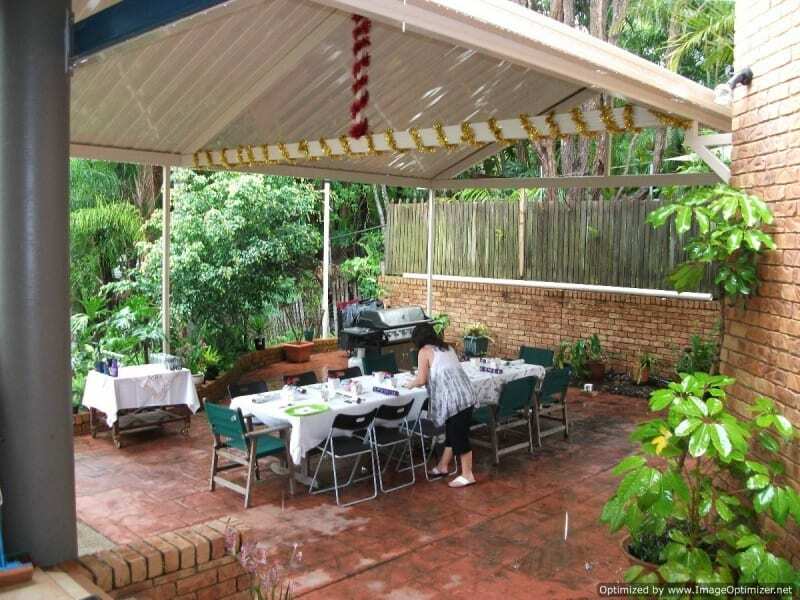 Make the most of the magnificent Brisbane climate with a custom designed outdoor home addition providing all year round protection and shelter while providing a great entertaining area for you to enjoy every day. A skillion patio is a flat roof design, with a minimum recommended fall of 2 degrees, differing angles of pitch create different visual effects and differing levels of protection from the elements. A skillion patio allows you to have roof spans of up to 7.0 metres by choosing the right roofing. Our single skin roof sheeting is Colorbond steel and is finished with an 80% gloss finish on both sides of the sheet. This makes us one of very few companies that offer high gloss roofing that is high gloss (and therefore a superior finish) on both sides. High gloss is easier to maintain, looks brand new longer, and reflects more light back into the home. This unique finish means your patio will be substantially cooler than other standard patio products in the market. 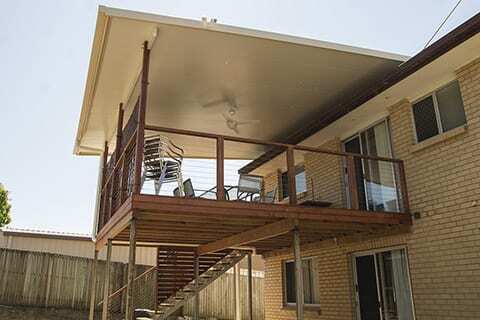 Insulated roofing is the most popular patio roofing in Queensland, we have very hot humid summers and insulated roofing offers the protection of an insulated polystyrene core between 2 sheets of Colorbond steel. The ceiling colour is gloss white and is totally smooth giving a crisp, clean ceiling look. The roof panels are available in a range of thicknesses, 50mm, 75mm, 100mm etc. The thicker the panel the more insulation there is but also the further the sheet can span unsupported. Insulated roofing has been used not only on patios but also carports and commercial buildings, for more information and technical data on insulated roofing visit www.solarspan.com.au. A gable patio provides you with a very spacious outdoor area that will allow the breeze to flow and light to stream in. There are numerous configurations available in a gable design, including open ends or various closed end designs. We can discuss your requirements and suggest what will work best to achieve your goals. We are very careful with all our designs to build your dream patio so that there are no visible fastenings or as few as possible. Our innovative king post system minimises the number of beams required making your new gable patio more attractive and more affordable. The use of colour bond flashing and matching guttering enhances colour coordination so as to compliment your homes existing colour scheme..